This was an exciting week for MOP as we completed the first oyster shell recycling project in Boston Harbor history. It is a wonderful story as there are so many pieces and volunteers that came together to make it happen. 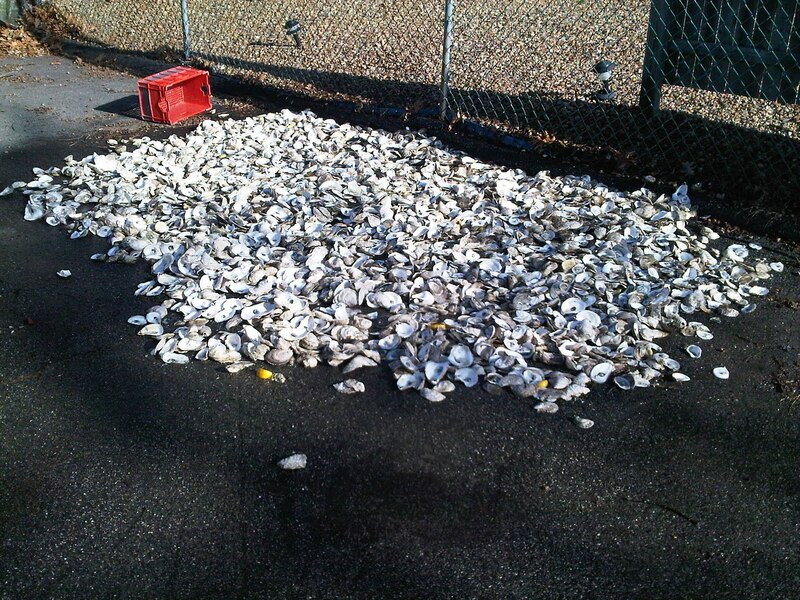 The story begins last winter when MOP was seeking oyster shell to place young oyster spat on to use in restoration. (This is a technique used by many groups that we wanted to employ.) 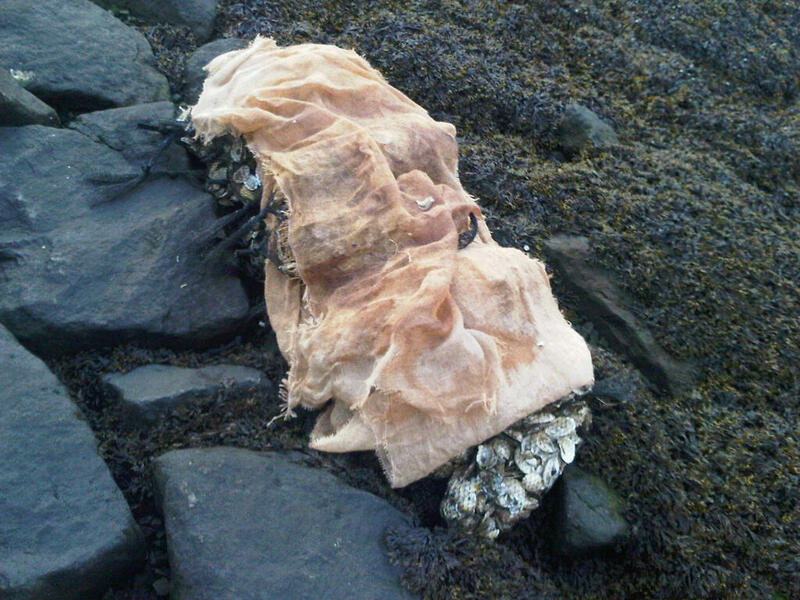 Basically you collect old shell, dry it, place it in mesh bags, and then set microscopic oysters (spat) on it. 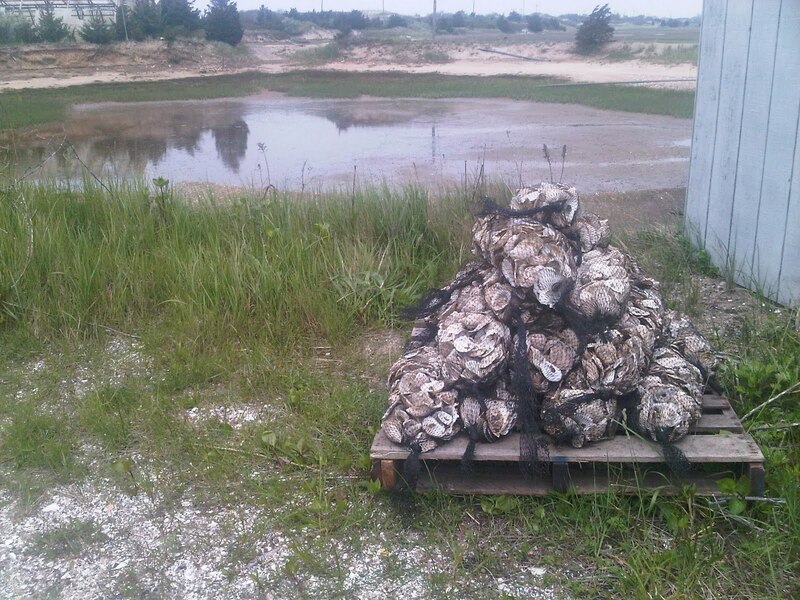 The oyster spat tend to grow well on the shell substrate and are better able to avoid predation. We have had issues with starfish and crabs dining on our oysters.Over the winter we were not able to find the shell we needed and a place to store it. So we thought we were done with this for 2011. B&G Oysters is a neighborhood restaurant located at 550 Tremont Street in Boston. Barbara Lynch's staff holds an Oyster Invitational there every spring. It is a wonderful event with oysters from a variety of locations. They have graciously provided MOP with a booth and even made a donation of the first event's raffle proceeds. The B&G facade at the big event. 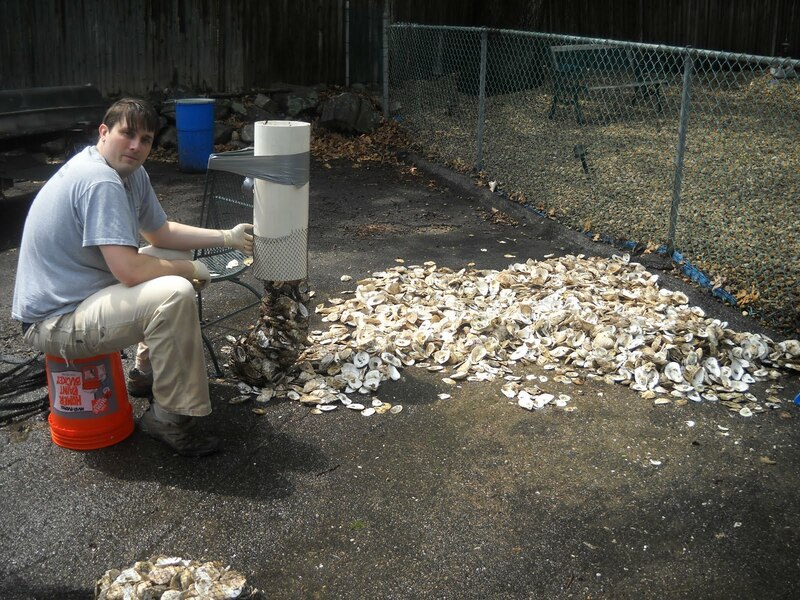 Mat dried the oyster shell on his driveway and then we packaged them in mesh bags for a trip to Aquacultural Research Corp on the Cape. Mat Brevard placing oyster shell into mesh bags. 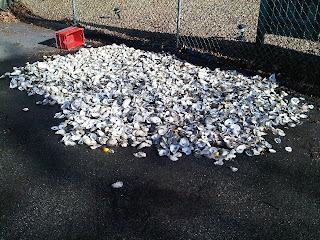 The bagged oyster shell waiting to get some spat added. ARC put the shell in the water, grew spat, and had them ready for us to pick up earlier this week. 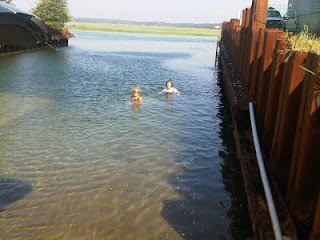 We had timed the trip to pick them up such that they would be in Boston at low tide. 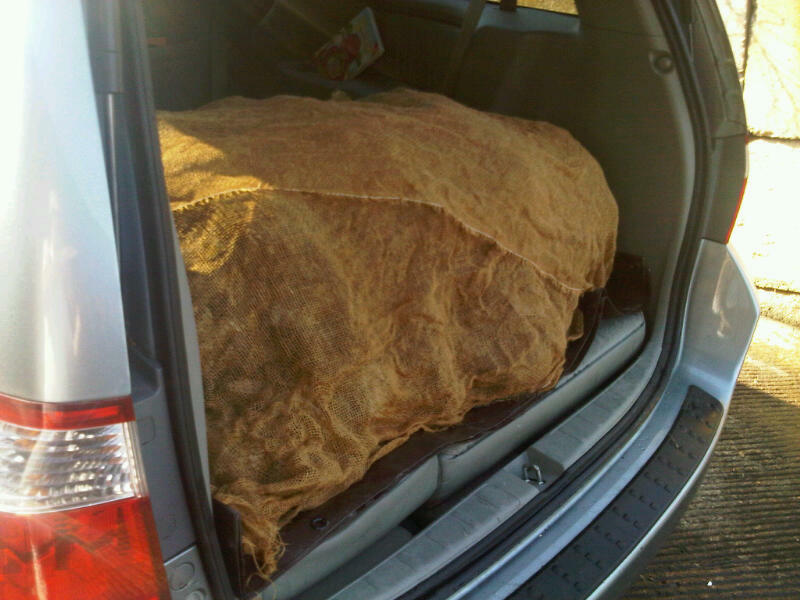 However, this meant when we picked them up in Dennis six hours earlier it was high tide. 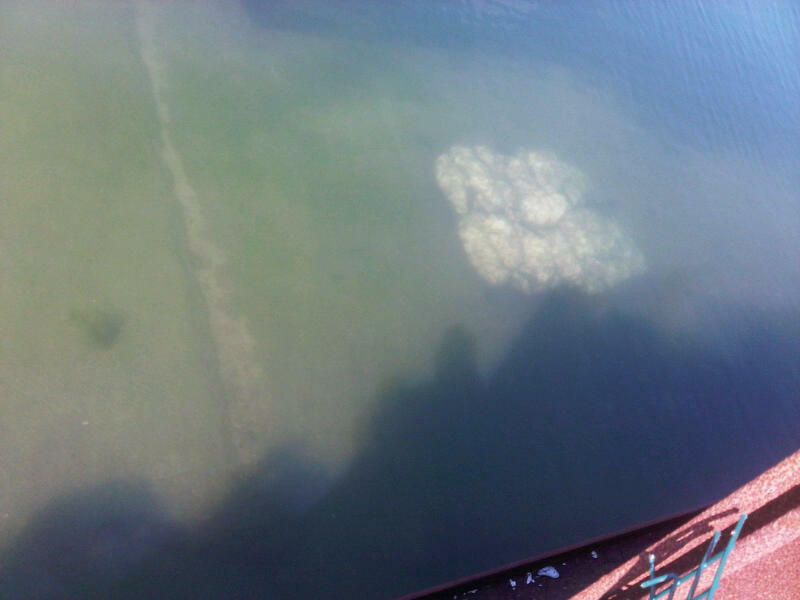 And our oyster shell was in deep water. Intrepid ARC employees went for a swim to get the oyster shell! Thank you Gail, Sue and Terry for going the extra mile. Gail and Sue fishing out our oyster shell. The oyster shell in the car wrapped in moist burlap. 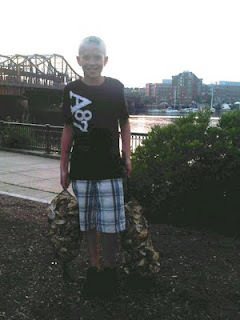 Mathew Wolfe working hard hauling shell. Recycled oyster shell waiting on the rocks for placement in Boston Harbor. We also recently learned that DMF is conducting a soft shell clam placement on Thompson's Island today. We think it is great that they are pushing this forward. We hope that they will expand their thinking and view the Harbor more broadly than as a source for steamer clams. An oyster reef shelters 100 other species including shrimp, crabs, lobsters, eels and young fish. These creatures in turn draw larger species. If we want to maximize the productivity of our harbor it will take a combination of programs.